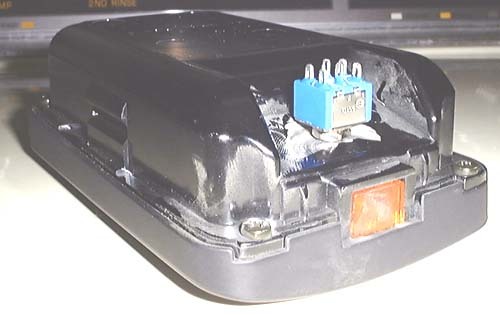 The PFS Powertrain Management Computer (PMC), also known as EFI's PMS, comes with a large rotary switch for changing boost to low, medium and high settings. The switch is so big it is hard to mount. 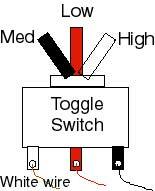 I decided to replace the switch with a small, 3-position toggle switch installed in the ashtray. I pulled out the Ohmmeter to find out how the PMC's rotary switch worked. The switch has 3 wires connected to it. A red wire connected to the center connector, and a black and a white wire connected to two peripheral connectors. I discovered that when none of the wires are connected electrically by the switch, the PMC is in the low boost configuration. When the red and black wires are connected, the PMC is in the mid configuration, and when the red and white wires are connected the PMC is in the high boost configuration. 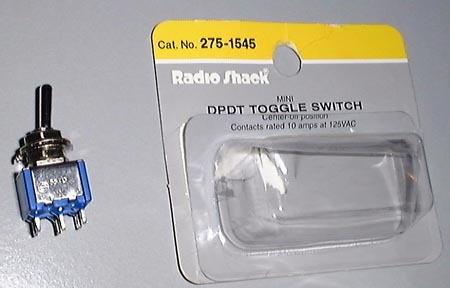 I then went to Radio Shack and picked up a Toggle Switch, Radio Shack Cat. No. 275-1545, Mini DPDT Toggle Switch (center off position), for $3.99. The switch is small enough that if you shorten the switches toggle lever, you can mount it in the ashtray for a clean, total stealthy look. Start the install by popping the ashtray out by simply pulling it straight up. Then pull the top of the center console loose by pulling it straight up. I grabbed it at the shift boot and popped it up and then pulled the corners up. To allow the ashtray door to close, you'll have to grind (or cut) the toggle switch's lever to 1/3 of an inch long (.33"). You can make it really short and it's still useable. I held the switch lever with a pair of needle-nose pliers and ground it down using an electric drill and a small grinding stone. A Dremmel tool with a cutting disk would work too, just be sure to hold the switch by the lever when you grind/cut it. The ashtray's bottom below the little shelf area inside the ashtray where I wanted to install the switch isn't flat and the plastic is too thick for the switch. So I ground off some plastic from the bottom of the ashtray to flatten and thin it. 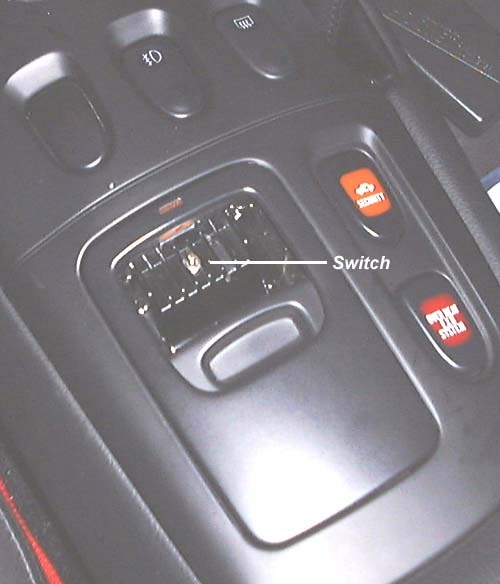 If you don't remove some plastic the switch will extend too deep and prevent the ashtray from fitting into its receptacle. I drilled a 7/32" hole in the little shelf, then reamed the hole out just a little until the switch screwed into the hole securely (remove the switches top cap nut and washers, you won't need them). If you do it right you will get a nice tight fit that doesn't require the switch's cap nut to hold the switch in place (see photo). Doing it this way will prevent the switch from sticking too far below the ashtray (which will keep the ashtray from fitting in its receptacle) or too far into the ashtray (which will prevent the ashtray from closing). Drill a 7/32" size hole in the center console's ashtray receptacle at the leading edge (see photo). Cut the rotary switch off the wire from the PMC and run the wire under the left passenger seat rail, under the carpet flap just below the console, then under the main console and through the hole in the ashtray receptacle. 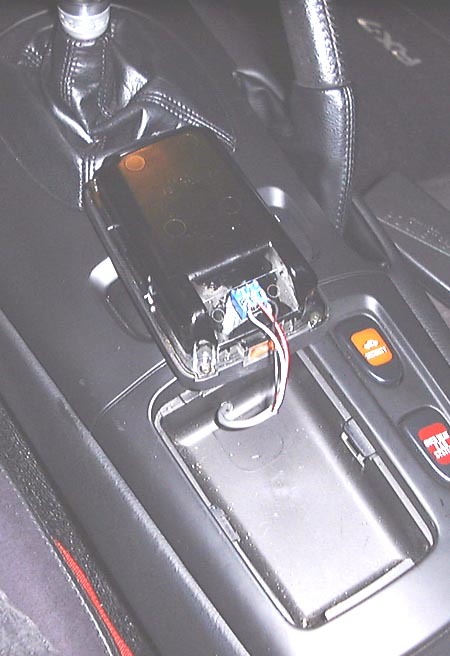 Pop the center console back down, feed the excess wire into the console, insert the ashtray and have fun.